Here it is, just past noon, the day before I am to prepare lunch for an office team of 50 at Ixds. I’m uncharacteristically calm given the amount of work that I typically put in on the day before catering for 50. I’ve just put the fourth of five vegan chocolate cakes that I’m baking for the team into the oven. Usually, by this time of the day, I would have had several trips to the market under my belt and barely started with food preparations. However, today I can feel proud that most of my prep work is done. 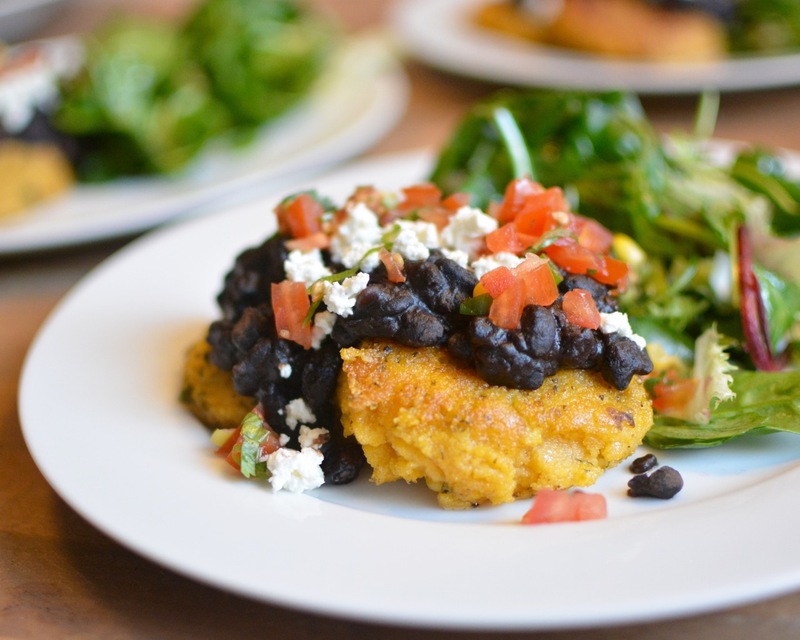 The polenta cakes that I plan to serve are made, as have most of the black beans that I am serving with them. Although I sit calmly now, I know all too well, how stressful and challenging it can be cooking for a large group. Most of the challenge lies in the fact that I don’t want it to taste like a meal made for 50 people, but rather a meal made for a small, intimate group of friends that I might have over for dinner. Whether I’m cooking for my close friends, a large team, or a group of strangers, I always want there to be something special about what I’m preparing for them. Sometimes, it can be a particular ingredient, like black truffle or saffron. More often, it’s about using the best of what’s available, like freshly squeezed lemon juice and fresh herbs, instead of juice from squeeze bottles and dried herbs from the pantry. But of course, sometimes bottled lemon juice and dried herbs are not just acceptable but are preferential in certain recipes. Ultimately, what it all comes down to for me is going the extra mile for the people I cook for. This could mean making homemade stocks for a soup, freshly baked bread, or beans from scratch, instead of from cans. For my offering of Polenta Cakes with Black Beans, I decided on making my beans from dried. Cooking dried beans are not just cost-effective, which is fantastic when you’re cooking for a crowd, but they tend to be more flavorful because you can control the flavor with aromatics like herbs, onions, and garlic. And given that canned beans are notoriously high in sodium, another benefit of cooking dried beans is that you control how much salt is in them. I recently discovered that it’s a myth that dried beans need to be soaked before cooking them. —This is a wonderfully, time-saving discovery considering how often I forget to soak my beans the night before I want to make them. I’ve learned that soaking them overnight only saves about 30-45 minutes of cooking time. So really, why bother with soaking beans for 8 or more hours? Just knowing that I saved all this time without the need of soaking my beans makes me even calmer and serene about the day ahead of me. This recipe makes about 12 cups of cooked beans. Add the remaining ingredients except for the salt. Cover and bring the pot to the boil. Then, turn the heat to medium-low and allow the liquid come to a low and subtle boil. Continue cooking for one and a hours, checking halfway to add more water, if necessary.